Ada Cambridge (1844 – 1926) was an English-born writer who we claim as Australian for it was here that she began her career as an author, and it is here that she has the claim to be one of our earliest novelists. Thirty Years in Australia is her memoir of life as the wife of Rev. George Frederick Cross in the Victorian parishes of Wangaratta, Yackandandah, Ballan, Coleraine, Bendigo, Beechworth and Williamstown, before returning to England in 1913. For contemporary readers it’s mainly of historical interest. The first chapter of this notable book bleeds with homesickness, for Ada Cambridge left England within weeks of her marriage in 1870 and did not return home for thirty years. The couple had no idea what they were letting themselves in for, because they had little in the way of information about Australia than other than the not-very-reliable novel by Henry Kingsley The Recollections of Geoffrey Hamlyn – and the ‘advice’ of a correspondent who knew nothing ‘of the mysterious Bush, which [she] thought of as a vast shrubbery, with occasional spears hurtling through it’ (Kindle Loc. 64-65). And the young bride also did not realise just how much she would miss her mother, her sister, her friends or the quiet way of life that she had tasted so briefly in the country vicarage in England. Steamships had taken over by the time she wrote this memoir, and Cambridge felt some nostalgia for the noble days of sail even though she suffered terrible sea-sickness. The journey took 77 days, and she remarks with some asperity that the young men of Melbourne took more interest in the name of the Derby winner than the news they brought with them that Dickens was dead. On land, she was delighted by everything: the weather, the hospitality of their welcome, and the metropolis, already at the time of her writing being romanticised with false images of kangaroos hopping down the street when in fact even in 1870 the only kangaroos were in the zoo. She was impressed by the unexpected refinement of Marvellous Melbourne, and especially the Town Hall, the Library, the Hospital and the Botanic Gardens, all institutions built from Gold Rush money and all still standing today. These positive first impressions were not to last. … we slept on the ground floor for the first time in our lives, all mixed up with drawing-room and garden, which felt very strange and public, and almost improper. Now I prefer the bungalow arrangement to any other; I like to feel the house all round me, close and cosy, and to be able to slip from my bed into the open air when I like, and not to be cut off from folks when I am ill. For more than twenty years I was accustomed to it, sleeping with open windows and unlocked doors, like any Bedouin in his tent, unmolested in the loneliest localities bynight-prowling man or beast. I miss this now, when I live in town and have to climb stairs and isolate myself—or sleep with shut windows (which I never will) in a ground-floor fortress, made burglar-proof at every point. (Kindle Loc. 291-297). Male house-servants, by the way, and men’s valets, seem to me quite out of harmony with the domestic traditions of this land. With us they mark no caste, save that of wealth, and belong mainly to those who do not know what to do with them. I have sat at breakfast with a regiment of men in full-dress livery in waiting round the table—a degree of state that, to the best of my belief, an English duke dispenses with—and this in a house with no morning-room to go to when breakfast was over, but only the same gilded and satiny drawing-room used over-night; and where guests who had never done such a thing in their lives might find themselves put to sleep in the same room with strangers. A young titled Englishman, to whom this happened, cut his acquaintance with the place in consequence, although his entertainers never knew it. (Kindle Loc. 2050-2055). Still, you don’t have to be a card-carrying feminist to be appalled by the workload of women in those days. Cambridge tells us of one clergyman’s wife who went mad under the strain, and of another who died prematurely. 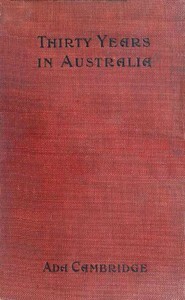 While she makes a point of saying that she began her first efforts at writing only to supplement the family income, and continued because the editor of The Australasian asked her to, she liked having a profession of her own because it liberated her from the endless demands of being a clergyman’s wife. (I get the impression that she wasn’t much interested in church politics such as the Disestablishmentarianism Movement and she wasn’t too enthusiastic about the endless fundraising and church entertainments that had to be supported). It was when she lost her first child, a daughter barely twelve months old, that she felt her isolation most keenly. There was a doctor, but he was not able to keep up with medical developments and for Ada Cambridge there was always a doubt that perhaps if they had had more money and lived in a less remote location, her child might have been saved. These are questions that shock some of my clerical friends, mothers amongst them. “It was the Lord’s will,” they say, and seem to think that settles it. A few months ago I was spending an evening with a young curate and his wife, whom I had not met before; they were ardently religious people, in their own line, and they had recently lost their only son. The mother gave me the history. He had had an internal tumour or something of the sort, a growth that steadily increased, and which the doctors had plainly said must be removed if his life was to be saved. The parents replied—and they repeated the words with such proud confidence that they were right words—”No, if the Lord intends him to get well, he will get well without that.” And instead of the operation—urged by their incumbent, who also gave me these facts, as well as by other friends—they had prayer-meetings at the bed-side. The little sufferer, described as a bright boy of nine, swelled and swelled until he died. “The Lord needed him,” said the mother to me. And “We feel so honoured to have a child in Heaven.” She made my blood run cold. I can never have shocked the “good” people more than that ultra “good” woman shocked me. (Kindle Locations 1574-1582). Apart from the trouble I have spoken of, and a bitterer one of the same nature that was soon to follow it, and the further misfortune of a carriage accident from the results of which I suffered for many years, my life at B——, socially considered, was more to my taste than had been the case before in Australia, or than has been since. For there I first discovered the resources of the colony in its intellectually-cultivated class, and enjoyed the society and friendship of some who represented it at its best—members of a small, inter-related, highly exclusive circle of about half a dozen families, who had had time and the means to read, travel, and generally sustain the traditions of refinement to which they were born. Chronologically, they were the first gentlefolk of the land—”Rolf Boldrewood” speaks of some of them in his Old Melbourne Memories—and they still merit the title in another sense. The clans have dwindled, indeed, but not all the original heads have fallen yet, and I have not heard of a mésalliance amongst their descendants. If they do not marry with each other, they marry with their kind. As with the Salisburys and Buccleuchs and modern London Society, they remain uncontaminated by the influences which have made our own little world of fashion a faint copy of the big one at home. Money, which “runs the show” elsewhere, is no passport to those dignified homes, dating from “before the gold,” in which I have spent so many happy hours. (Kindle Loc. 1646-1657). The charms of solitude at “The Old Parsonage” were outweighed by its disadvantages when I became that miserable creature, the confirmed invalid. The fire danger which made me nervous in summer was bad for health; the silence and loneliness of the winters, when nobody came, were worse. My husband, of course, was much away from home; the servants lived in their detached house; and so good and capable were they that for a time—after the elder babies began to go with Miss C. to school—I saved the expense of my dear little lady-help, who, however, came back to me later on. It was only with the greatest difficulty that I could get hold of my own children. Their devoted nurse and mine, already mentioned, watched us like a cat to keep us apart, lest their exuberance should fatigue me. The hour before tea (not afternoon tea, but the solid evening meal) was grudgingly conceded to us. Maria—she, like Dik, is dead, and I may give her the name now held in so much love and honour—would then bring them, beautifully brushed and garbed (she used to put clean socks and pinafores on them twice a day, although there was nobody but ourselves to see them), to my sofa side, and permit us to play together, provided we behaved ourselves. All the while she hovered in the doorway to see that I was not clambered over or roughly handled in any way, and long before time was up would advance to sweep them out, with her “Come now, I can see that mother is getting tired.” She saw it before I did. They were as good as gold, thanks to her splendid training. Never were such model children—until the day that, as a broken-hearted bride, she parted from them, when they “played up” in a manner to drive the house distracted. When they had their little aches and pains, and I used to beg Maria to let them sleep in my room, she would not allow it. Many a time have I surreptitiously carried a fretful child to my bed, and settled down with it comfortably, as I thought, and then had it gently but firmly taken from me, despite my expostulations. I had, at anyrate, the comfort of knowing that no mother could tend them better than she did, and the theory of the household that I was not strong enough to stand anything had some foundation in fact. But my inactive life—although I still got through a large amount of sewing and novel-writing—and my many hours of brooding solitude, had their own bad effect upon my broken health. There came a day when I declared, with tears, that if I had to spend another winter in that place I should go melancholy mad. (Kindle Loc. 1993-2010). For historians, the chapter about the Land Boom-and-Bust in Melbourne might be of interest, but I found it dull and was by then becoming a bit tired of Cambridge’s judgemental opinions about the vulgar wealth of Australians. I was reading this in a desultory way at more or less the same time as I was reading Kitty’s War by Janet Butler, and so I was beginning to analyse Thirty Years in Australia from an historian’s point-of-view, identifying the reasons for omissions and inclusions. Conscious of her audience, Cambridge is always positioning herself as a genteel lady of no pretensions where her simple clothes and rudimentary accommodation are concerned, because this conforms to the idea of humble self-sacrifice in the service of their religion. She shows that she is prepared to ‘rough it’, but she makes sure that her readers know that she is adhering to ‘standards’ of behaviour suitable for a clergyman’s wife. She is writing for an English audience who share her perceptions of the colony, playing to their notions of superiority, so she includes her associations with what passes for society so that she establishes herself in its upper echelons, while at the same time stating that of course it was the governor’s wife who sought out her friendship, not the other way round. “Mullens,” to start with—everyone who knows Melbourne at all knows that delightful haunt of the book-lover—and all the new books I could want, and more; and never the lack of a new magazine to entice me to bed early. Any night of the week—the day’s work done, even to the last toilet, and a reading-lamp shining softly down upon the page before me—I can realise my idea of luxury. Old books too—the Literatures of the Past and of the World (of which I had scarcely heard in youth before I was cut off from access to them)—these I could batten on, and at no cost at all. The great Free Library—the greatest, to my mind, of all Melbourne’s civic institutions—was but an hour’s distance from me. It is rather the resort of the street loafer, looking for a place to rest and doze in, than of the student—other than press hacks and such like, who go there with the business note-book and pencil; one never sees—at least, I have never seen—any of those gentlefolk who throng Mullens’s daily; it seems to lie off the track somehow. I, like the rest, forget to go often when I might go, but when I do think of it I am amazed at my neglect. A lending library is included in the many privileges conferred upon those who pay nothing, and there come from it into the family circle weighty as well as up-to-date works not otherwise in library circulation, and beyond the resources of the family purse and the family bookshelves. For one reason why we do not buy books much more largely than we do, is the want of settled homes for them. To a people so wandering and restless, books in quantities become physically burdensome; they take up too much room in a temporary house, and are too costly as travelling furniture. By the way, I have not found that rich people, with whom these considerations need not count, care to accumulate them. (Kindle Loc. 3490-3503). Interestingly, she devotes a whole chapter to her dog Toby who seems to have been a lovable scamp. Cambridge is devastated when he is given away because of the discord his mischief causes and bitterly regrets allowing it to happen. This interlude in the memoir made me feel more sympathetic towards her, because I think this chapter is a metaphor for the loss of other friendships, that were lost as a result of all the moves she made in her life. For all its irritations, however, Thirty Years in Australia is an interesting slice of life, and I may yet venture into some of this author’s fiction in due course. Yes, you are becoming a fine historian with your analysis of what gets included and left out and why. Thanks for the review. I have read Sisters and A woman’s friendship (I think that’s the title). 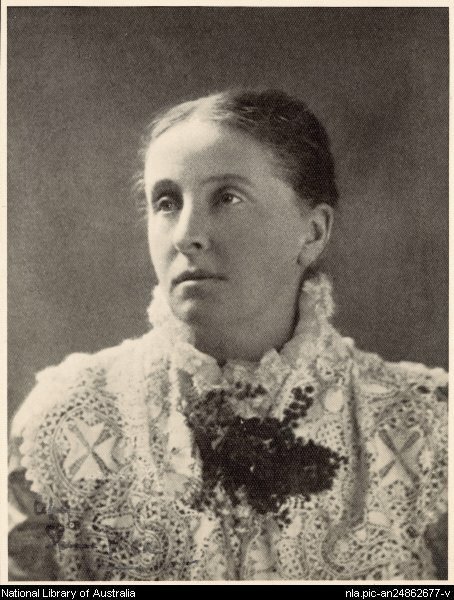 I think she’s a fascinating woman and writer … and, like Rosa Praed, wasn’t fearful of being honest about women’s lives. Rosa Praed? Tell me more, I’ve never heard of her! She’s another late 19th-early 20th century Australian writer. I read her The bond of wedlock around 20 or more years ago. It’s fascinating — and not really what I expected for the period.